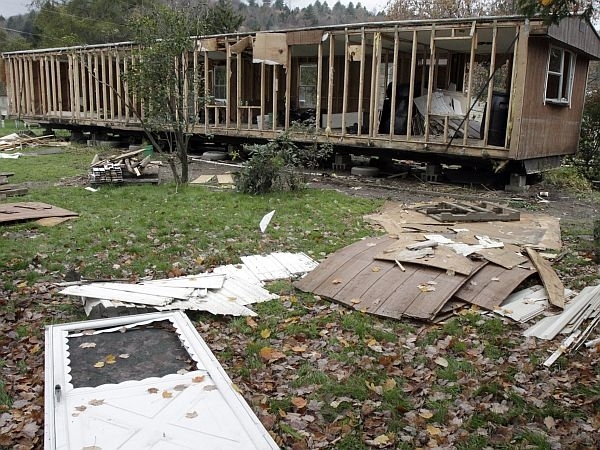 (Host) More than 100 mobile homes were destroyed in the Irene floods last year. For those who need to borrow money to replace them, the mortgage market is an obstacle because the terms and eligibility requirements are different than they are for other homebuyers. Advocates in Vermont have been working on a new loan program they hope will pave the way for a better financing model. (Zind) For mobile home owners, it’s always been more difficult to get a loan compared to regular homebuyers. Emily Higgins is Director of Home Ownership at Champlain Housing Trust. (Higgins) "Many financing options have a very high interest rate of perhaps 11 percent and a loan to value requirement that people put 35 percent down as a down payment." (Zind) Higgins adds that it’s also harder for mobile home owners to get loans because they’re considered a higher risk. Higgins has been working with legislators, state officials, banking groups and other non-profits to create a pilot mobile home financing program. The goal is to raise five and a half million dollars to provide long term low interest loans with lower down payments to 100 mobile home owners affected by Irene. The money would come from federal funds, philanthropic groups and the state. Jennifer Hollar is Deputy Commissioner of the Vermont Department of Economic, Housing and Community Development. Hollar says the hope is to create a program that can sustain itself, using payments from existing loans to finance future ones. (Hollar) "We know that there are very limited resources there and we want to target them to helping meet the needs that we see post Irene but also want to try to leverage them in a way that can meet an ongoing or broader problem at the same time." (Zind) Advocates like Emily Higgins of Champlain Housing Trust say Tropical Storm Irene has brought attention to how important mobile homes are in providing housing for low income Vermonters – and to the need for a better financing program for their owners. (Higgins) "It’s been a long-term ongoing need and a lot of people have been aware of it but Irene has been a catalyst to force us to realize what a great need there is." (Zind) In Montpelier, lawmakers are also looking at other ideas designed to help mobile home owners affected by Irene, including waiving taxes on the purchase and sales of mobile homes. In 2011, floods in the spring, and Tropical Storm Irene later that year destroyed more than 150 mobile homes and damaged hundreds of others. A meeting in Burlington Friday took stock of long term efforts to minimize future storm damage at mobile home parks. The state says the Federal Emergency Management Agency has shown some flexibility and provided additional funds to people who lost mobile homes to Tropical Storm Irene. Officials see this as a positive development in what has sometimes been a rocky relationship between Vermont and the federal agency.